Applications of bio-based polymer materials are very diverse. Traditionally they are used for making paper, wood, leather, textiles and so on. Similarly the polymers obtained from nature can be used as food additives, like thickeners, or as wound dressings. With the success of synthetic polymers many nature based biopolymer materials like celluloid, cellophane, casein-formaldehyde and Rayon became less popular and currently are a relatively small part of the market. Nevertheless these polymers need to be re-examined as their properties can be optimised by including inorganic nanofillers, such as natural clay, graphene(oxide) and similar high aspect ratio nanoparticles. By combining traditional materials with state-of the art materials science we can mimic the structure of natural materials like nacre (shells), teeth and bones. coatings, in particular the concrete curing compound “Delft Green” available via NGCM. Biobased polymer materials have the advantage of being sustainable and biocompatible. They can be processed in environmentally friendly solvents, often from aqueous solutions, preferably using the water they are made in anyway. They are non-toxic and non-flammable. 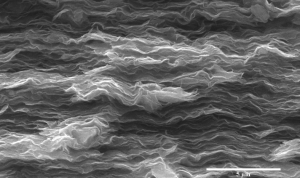 By mimicking natural materials like nacre, bone, wood it is possible to produce lightweight polymer materials with ultimate properties that are able to surpass those of current man-made synthetic polymers. Nacre like structure of Na-alg/MMT, ESEM image J. Zlopasa (TU Delft). In developing the materials we are aiming at low-cost high volume products where the availability and low price of the required ingredients can best be utilised. In addition we aim to as much as possible use natural additives for fine tuning of the ultimate material properties.